I was trying to scan in a bunch of pages that had printing on both sides. Adobe Acrobat supports duplex scanning, even for scanners that don't have native support for duplex scanning. The problem is I couldn't get it to work with my Brother MFC-8820D printer/scanner. The problem appears to be using the "TW-Brother MFC-8820D USB". 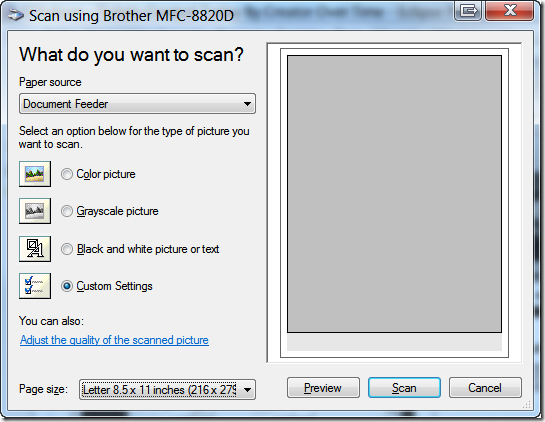 As soon as I switched to using the "WIA-Brother MFC-8820D" scanner driver everything starting working well. In the "Scanner" box, select "WIA-Brother MFC-8820D." NOTE: You can safely ignore this message. 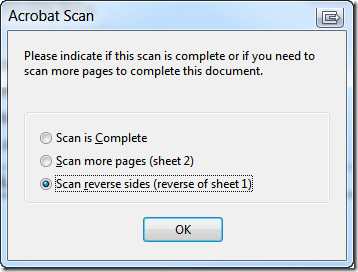 In the "Sides" box, select "Both Sides"
When the "Scan using Brother MFC-8820D" dialog appears, select "Document Feeder" as the "Paper source"
Great article. I needed something like this for long and was almost tempted for investing in duplex scanner. So I hope in this case, Adobe printer driver arranges pdf pages accordingly. I have Brother MFC-J5910DW. Can I achieve the same results as you mentioned here? Also do you have any adventure done on OCR? I also have have Brother MFC-J5910DW. Can I achieve the same results as you mentioned here?